This is fascinating. Are you familiar with Daniel Boyarin's Border Lines? If so, I wonder if, rather than Syriac Christianity influencing an expanding Islam, Christians who had been marginalized through the heresiological discourse re: Modalism/Sabellianism/ Monarchianism found the Islamic emphasis on the unity of God a more comfortable home for their christology. If so, could these "ways of remembering Jesus" be remnants of earlier Christian christological work not so much appropriated by Islam so much as grafted into Islam by those for whom the label "Christian" had previously been problematic? I'm thinking well beyond my area of expertise, so if this comment is wildly off the mark I'll understand. Just thinking out loud . . . Interesting thought on the development of the Simon of Cyrene tradition. The concept of swapping places is oddly enough also present in the modern Jesus tradition of Shingo, Japan, that claims that Jesus' twin brother Isukuri "casually" took his place on the cross, while Jesus returned to Japan where he had been trained in Shinto previously. I imagine there are many variants of the swap idea around. I believe that the Koran also says that Jesus is the Messiah and will return. Of course in practice, no-one is going to volounteer to take the place of someone who is about to be executed. But our literary editors could be very creative and work wonders of substitution. Judas fell headlong, his body burst open and all his intestines spilled out. Such was the kind of result one might have expected from the first stage of a traditional Jewish stoning which involved being pushed from a high place. This was after the trial of the prophet on trumped-up charges. But the 'crowd' (I suggest the prophets) had wanted Barabbas ('the son of his father', imo Judas, the son of the prophet Zechariah who had been murdered in the temple) released. The Pauline editors had their first created substitute for Judas, John the Baptist, beheaded, and their second created substitute for Judas, Jesus, crucified as a sacrifice for sins, in effect mimicking the temple cult, which says quite alot about the editors -they were not prophets, but disenfranchised priests creating the revised 'Christianity' with the approval of their Flavian masters. And Judas was replaced 'in his place of leadership' by lot. 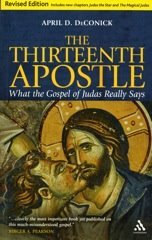 Regarding the Muslim view that Jesus' "crucifixion is either portrayed as an event that only appeared to have happened, or someone like Simon the Cyrene or Judas Iscariot was made to look like Jesus and was crucified in his place," it is interesting to look into the Talmud of Jmmanuel's report on that. That's because its co-discoverer, Eduard Meier, is still alive, and those who have known him well all vouch for his honesty and lack of deceit. This Talmud has Immanuel/Jesus, when carrying the cross (no mention of a separate crossbar), collapsing under its weight, with Cyrus of Cyrene then being forced to help carry the cross to Golgotha. Neither Cyrus nor anyone else is mistaken for Immanuel, which makes sense because it was Immanuel who had just been scourged and bloodied up. It is Joseph of Arimathea who notices that Immanuel is not quite dead on the cross (but perhaps clinically dead or in the deepest state of samadhi). Joseph goes for help to secretly tend Immanuel after placing him in his own tomb. After the three days and nights Immanuel shows himself only to those closest to him, warning them not to reveal his survival. Following a couple years spent incognito in Damascus, he travels much with mother Mary, his brother Judas Thomas and another. The best known book giving the evidence of his travels along the Silk Road and his long life in the Kashmir area, is by Holger Kersten. Interestingly, it is mentioned without any debunking by Diana Eck in her book Encountering God. However, this Talmud's co-discoverer and editor, E. Meier, has received very heavy debunking. Richard Fellows naively believes that much of the name changing in the NT was done to protect individuals from persecution. He underestimates the creativity of the Flavian editors who enjoyed playing literary games to conceal true identities and the real the history - as I am sure Eisenman would say. For example, in Mark 1, the two individuals James and Simon are each given a brother (James John, Simon Andrew) to conceal the fact that the real brothers were James and Simon, sons of Judas. A similar playful literary obfuscation arises in Acts 15:22 with the introduction of two fictitious names, Silas and would you believe Judas Barsabbas. Thus the editors were well aware of Judas being 'the son of his father' in the sense that Judas was like his father Zechariah, a prophet. Silas and Judas Barsabbas were supposedly sent by the Jerusalem church to accompany the fictitious Paul and Barnabas back to Antioch. In reality, James and Simon simply returned from Jerusalem to Rome. There was no church at Antioch. In denying Jesus's divinity they deny specifically that he was the son of God, in what is to me a particularly eloquent verse of Qur`an, 19:35. "Over and over again, in contexts within which the Targum has the activity of the Memra, the rabbinic midrash has the designation of God as “He who spake and the world was,” thus constituting a most impressive body of evidence for the tacit, but nonetheless vigorous repudiation of Memra theology on the part of the Rabbis" (Boyarin, Border Lines, 139). Boyarin argues this is a rabbinic response to "Two Powers in Heaven" theology, or Logos theology, of which Christianity would be one significant example. I wonder (perhaps completely erroneously) if some [Syriac?] Christians who found Christian identity problematic because they agreed more with the Rabbi's emphasis on the unity of God, but for whom Jewish identity was problematic precisely because of some attachment to Jesus and/or his teaching, found Islam a welcome "third option." What an interesting contrast all of this makes with the portrayal of Jesus in the Talmud, for which one can read Peter Schaefer's book, "Jesus in the Talmud," to get a general sense. I also recall as an undergraduate taking a class on Christian-Hindu encounters with Brian Hatcher at Illinois Wesleyan University, talking about portrayals of Jesus in Hindu literature (Jesus as Yogi, for instance). I could almost envision a fun, perhaps experimental, introductory class on the images of Jesus outside Christianity, although Jesus in Christianity, Judaism, and Islam would probably be quite enough when speeding through material in one semester. I see Margaret Barker's new book on the Original Christmas will deal with the Qur'an traditions, too.